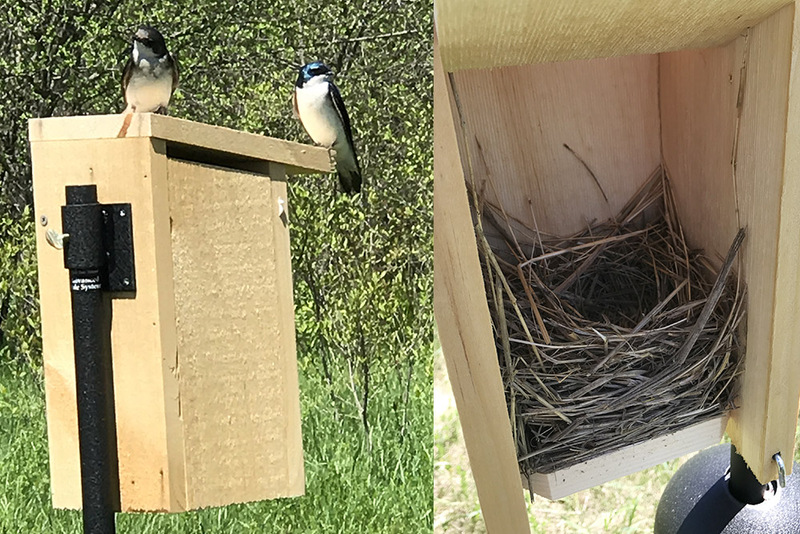 Our bluebird houses have attracted attention of birds! Most houses have some straw in them, one has a nearly complete nest. Do we know what species we have attracted? Not yet. The fuzzy bird photo is not clear enough, but we will go back with telephoto lenses to get good pictures. We also are not yet skilled enough to recognize what sort of bird nest is being built by looking at it. But it is nice to know we are working in some sort of partnership with mother nature. Seeing Mr. and Mrs. Bird raising a family in a house we put there for them is sweet. If you wish to observe these birdhouses, in Central Field, please don’t get too close and drive the birds away! There are eight houses there, in four pairs of two, the ideas being that one of each pair is for aggressive birds, and the other is for “good” birds, like our fabled bluebirds.